Fernando Alonso is an odd one, isn't he? While his place at least somewhere within the sport's pantheon of great drivers seems assured by now, citing single astonishing performances from his career - drives from the Gods, if you will - is a little tricky. With many of the other F1 greats such drives can roll off the tongue: Fangio at the Nurburgring in '57, Moss in Monaco '61, Clark in Monza '67, Senna in Donington '93, Schumacher in Hungary '98... Even within Alonso's 2012 campaign, one which only the obdurate would suggest was not one of the most persistently impressive seasons from anyone ever, naming individual performances of that rank is difficult, maybe Valencia aside. His year's effort was more based on relentless brilliance, a 9.5 out of 10 performance just about every time. 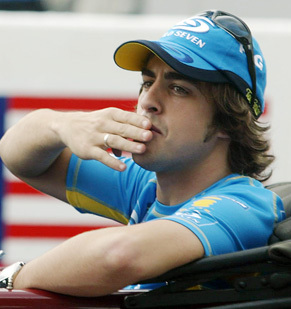 But there is another drive in Alonso's career that we can point to as being up there, that of Hungary in 2006. Now, you'd be forgiven at this point for feeling rather bewildered, as it's not a drive talked about much. Indeed, it even seemed that the drive's quality had been forgotten in certain quarters before the race had even finished. Perhaps because it was a drive that didn't last all of the way to the chequered flag (and F1 is a results business), perhaps as well it reflects that the focus after the race was elsewhere (for one reason in particular). But whatever the case these do not begin to diminish the quality of Alonso's performance that day; it can absolutely be considered as a forgotten marvel. Ah, Hungary. For much of its now quarter century-plus history as an F1 venue its Hungaroring has not won many popularity awards. Yes, it's always attracted a numerous, multi-national crowd; it's the layout that's been the problem. It arguably was the first of the new generation of tight, torturous tracks that gradually replaced the classic high-speed challenges such as the Österreichring and Zandvoort on the calendar. 'Monaco without the houses' was a polite description made in the circuit's early days. Nigel Roebuck noted that when the fraternity first laid eyes on the 'purpose-built' venue in 1986 'we swiftly concluded that part of that purpose had been to prevent motor racing. Tight and sinewy, it amounted to a prescription for soporific grands prix.' Jabby Crombac was less restrained, as when one year he was asked by a local how the track could be improved he replied 'Dig it up'. Yet somehow, in addition to the Michael Schumacher drive already mentioned, it has developed a partial knack of being the scene of great drivers putting in great drives. And so it was in 2006. And as in many classic drives, Alonso had plenty of adversity to overcome that day. He'd claimed his first world championship, then the youngest ever to do so, with Renault in 2005. And the following campaign was started superbly: at the year's halfway point from nine rounds Alonso had six wins and three second places on the board - only six points dropped in other words. And this even though Michael Schumacher and Ferrari had strode back decisively after the bottom had fallen out of their challenge in 2005. Alonso then put in a tepid drive in Indianapolis in round 10, finishing fifth, but that was thought to be no biggie as that was a track he'd long struggled at. Then in Friday practice for the Hungarian race, perhaps under pressure, Alonso for probably the only time that year scored an own goal. Believing that Robert Doornbos had balked him on a quick lap Alonso pulled alongside him, waved at him, and then moved ahead in order to 'brake test' him. This, in addition to overtaking under yellow flags later in the session, got Alonso a two-second time penalty for his best qualifying effort. It would result presumably in him starting mid-grid on Sunday, on another weekend wherein his championship rival Schumacher was expected to have the place to himself and thus was well placed for a sizeable net points gain. But the following day Alonso had a significant stroke of good fortune, as Schumi got a two-second penalty of his own. This time for overtaking two cars, including Alonso's, under red flag conditions in Saturday morning practice. There was some dark muttering emanating from the Ferrari camp suggesting that Alonso had 'drawn the foul' from Schumi, by going rather more slowly than you'd expect. But whatever the case the outcome remained the same. Thus we had the highly unusual sight of the two drivers who had the 2006 season pretty much to themselves (only one race from the 12 up until then had been won by someone other than Alonso or Schuamcher) both starting the race from down in mid-pack: Schumi P11, Alonso P15. Jenson Button in his Honda also was unnaturally low having been relegated from P4 to P14 thanks to an engine-change penalty. And on race day things got doubly unusual. Races at the Hungaroring had long been associated with fine sunshine and intense heat, yet on race day morning this time it rained. It had stopped by the time of the race start, but the track remained wet and thus it was intermediates all round (aside from Rubens Barrichello in third who, wrongly as it transpired, started on the full wet). Alonso's brilliant race-day drive began at its most brilliant on the first lap. He got off the line well, but rather ran out of space in the run to turn one. As it was at that point he was still in P12 (helped by Christian Klien starting from the pitlane), but then Alonso proceeded, and did so as if the track he was on had less water on it than it did for everyone else. No matter your pace advantage passing in the Hungaroring's back section was (and is) considered about as probable as passing around the outside of Casino Square: you don't do it in other words. But no one had told Alonso: at turn one he moved around the outside of Ralf Schumacher's Toyota, then passed Mark Webber's struggling Williams before turn two. Then at turn five, never before viewed as a passing spot, the Spaniard managed to vault past both Nick Heidfeld and David Coulthard in the same swoop - again around the outside! At this point the director of the TV world feed twigged on what Alonso was up to and switched focus, just in time for Alonso to dive down the inside of Robert Kubica, making his F1 debut, into turn nine. And before the lap was out Alonso had ambushed Felipe Massa too, claiming the inside line - and almost ending up in the pitlane as he did so - into the final corner. One lap, and six scalps had been seized. For various reasons Alonso's opening tour is unlikely to go into folklore in the same way as Ayrton Senna's at Donington has, but it doesn't seem all that unreasonable to put it somewhere within the same league. As for Alonso's rivals, Jenson Button had only made it up from P14 to P11 by this point, and while Schumi had also shown his class in getting up to P4 most of his gains made were in the run off the line to turn one. Otherwise only Giancarlo Fisichella and Felipe Massa had been passed by him on that lap and in the latter case it was when Massa had slid off the track. 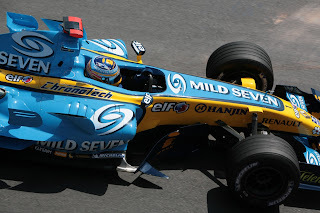 Alonso sailed past his team mate Fisichella on lap two and set his sights immediately on Schumacher in fourth. Unusually in such conditions, the Bridgestone tyre Schumi was on wasn't offering much grip at that point, particularly at the rear, compared with the Michelins Alonso and others were on, and it showed as Alonso was capable clearly of going several seconds a lap faster. But Schumi as we've come to expect was nevertheless selling his hide as dear as they come, putting his car in all of the wrong places as far as his pursuer was concerned. For a lap the two cars were as one, Alonso seeking to pass at every angle, before he repeated the party trick of lap one: sweeping clean past Schumi around the outside of turn five. And then he left him. Alonso then nibbled at the advantage of the three cars that remained up the road, and eventually a further layer of the quality of Alonso's drive was revealed as those ahead - Kimi Raikkonen leading in his McLaren, his team mate Pedro De La Rosa second (providing a stop gap for the Woking team after Juan Pablo Montoya's abrupt walk out a few races earlier) and Rubens Barrichello's Honda (as well as Jenson Button behind) all peeled into the pits for their first stops while Alonso pressed on, now leading. So in other words what Alonso had been doing had been with a much heavier fuel load than most of those around him. And there was more to come as, aided perhaps with tyres scrubbed in more than those of his freshly-booted rivals, Alonso went into imperious mode. He now started to lap routinely three seconds a lap faster than anyone else, and by lap 25 he was 40 seconds clear of the two McLarens, and some 49 seconds clear of Button, and in each case Alonso didn't look to be planning more pit stops than them before the end. A couple of laps earlier he'd lapped the sport's regenmeister Michael Schumacher (who admittedly had been delayed by a front wing change after running into Fisichella while the latter was passing him). This was a rout. But lap 25 as well as being Alonso's crowning glory was also the point at which his day began to unravel. Second-placed Raikkonen vaulted over the back of Vitantonio Liuzzi's Toro Rosso while lapping him, Kimi later admitted that he'd been caught looking in his mirrors rather than ahead. It put both out, and brought out the safety car. While Alonso was able to pit while the race was neutralised he also lost just about all of his lead, as well as whatever advantage he was enjoying from his more scrubbed in tyres. Alonso remained 6.5 seconds clear of the now second-placed Button (who hadn't pitted under the safety car) as green flag racing resumed, thanks to some traffic. But Button due in part to a combination of a lighter fuel load and tyres more up to temperature (as well as Alonso having a brief scare on lap 34 as he accidentally hit the wrong button on his steering wheel, putting the car into neutral for a few seconds) was now able to hunt Alonso down and by the time of the Englishman's next stop on lap 46 was but half a second behind. Alonso pressed on and by the time of his own stop five laps later it was just about time for dry tyres (still known as slicks at the time, despite featuring grooves), as the track had dried throughout. With Button still on intermediates it appeared a master stroke by Renault, and one that would ensure that Alonso after all would triumph for one of the finest wet-weather victories of all time. But it appeared that way only fleetingly, as the locking mechanism of Alonso's right-rear wheel didn't work in the wheel change, meaning the nut hadn't gone on properly. After emerging from the pits Alonso just about scrambled through turn one, but come the downhill turn two there was nothing he could do as the wheel worked loose and he was sent straight into the tyre barriers and out. It was beyond cruel. This gave Button the race on a plate, and having switched to slicks himself a couple of laps later he reeled off the remaining laps to claim a long-overdue first Grand Prix win. And it was this - the likeable Button's debut victory, the first win for an English driver since 1999 - that got everyone's attention, at least in the British media. The quality of Alonso's drive scarcely was mentioned. Perhaps this was inevitable, but it seemed a terrible pity. And it wasn't just the non-specialist press that was culpable, Autosport was just as much. Having devoted its front page (with the green masthead to mark a British triumph), editorial, a ten-page tribute to his life and times (kid ye not) and most of its race report to Button's breakthrough triumph, its Grand Prix Editor Mark Hughes made a few claims that made you wonder it he'd actually paid any attention to what Alonso had done that day. This included that Jenson Button is 'the only driver who might be a match for Michael Schumacher in full wet conditions'. Does that explain why Alonso, at the point that the safety car came out, was 49 seconds clear of Button, lapping three seconds a lap faster, and had him and everyone else utterly on their knees? Hughes further claimed that Button victory was 'primarily a driver's victory', that his early-race progress up the order, markedly slower than Alonso's, was 'decisive, clean and ballsy...when it was vital not to get stuck in the midfield and let the leaders escape'. Erm, I refer you back to the 49 seconds point Mark. And as for the safety car on which the race pivoted, in his race report Hughes only mentioned its deployment in that it gave Alonso a 'free pit stop'! Of course, one doesn't want to be churlish. It wasn't that Jenson Button did not drive well nor that he did not deserve to win a race. It was much more that Fernando Alonso didn't deserve to lose this one. And somehow that fact got lost somewhat under the descent of nationalistic Button fervour. Perhaps it is high time that Alonso's mesmeric drive of that day was rediscovered. Thanks for bringing back this incredible performance to your blog and for the honesty of pointing how biased journalism can be. Fantastic article! to consider how Piquet is underrated. a very fast driver, compared to his own previous years). it is not simple to recognize that. I have to thank you for writing this piece. It really is a forgotten titanic performance by one of the sport's all time greats, and you really gave it proper perspective. Also, shame on mark hughes for writing that tripe. I used to think he was one of the most analytical writers reporting in the paddock, but it seems he's just as capable of sensationalist biased reporting as anybody else. Quote from my Autosport report: "A faulty wheel locking mechanism cost [Alonso] what would have been a brilliant victory." No. That was because Fernando had not yet pitted but Button had. That cost around 30 of those 49 seconds. The remaining 19s were lost by Button's first lap not being as brilliant as Alonso's. But you must factor into that the Honda was hopeless at getting heat into its tyres and the Renault was superb at it. Also that even in the dry the Renault was WAY quicker off the line that the Honda (better weight distribution, much less peakier engine). So it took Button longer to get past the Bridgestone cars than Alonso, which is where most of the 19s went. But once they were each on a clear bit of track, there was virtually no difference in their pace. Alonso pulled out 9s on Button in a few laps at the restart because Button was repeatedly baulked for 3 laps by the lapped Massa! Once past the Ferrari Jenson was again lapping super-fast - actually up to 2s faster than Alonso for a few laps. He reduced that 9s to 5s within two laps of passing Massa. Alonso responded, upping the pace, but still Button closed him down. Button wasn't going to win it because Honda couldn't gamble on putting him onto dries as early as Renault could with Alonso (again because of the Honda's lack of warm up). It was a brilliant drive by both men, but Alonso's brilliance was on his early laps racecraft and on peak pace in the wet Button was actually faster despite a slower car. 3) I really don't think I did get it wrong. Thanks very much for getting it touch, it's very much appreciated to hear your take on this. What you say is insightful as always. I would like however to dispute your conclusion about my article that my ‘choice of stats is grossly misleading re the pit stop'. I state explicitly in the article that Jenson Button had pitted prior to Alonso establishing his 49 second lead over him, so at no point did I mislead on that point. Also, which again is what I state explicitly, my point was not about the number of stops made at the point of Alonso’s 49 second lead but rather that it appeared Alonso *from that point* was not planning more stops than Button as he was running so much longer before pitting (he pitted 10 laps later which suggests planning two stops to Button’s three). And this indeed is what happened as both subsequently pitted twice. Granted, given it was a wet-dry race Button may have made an extra stop with a switch to dry tyres in mind, but also because of this he was running with a lighter fuel load for longer (indeed he took fuel on in his final stop when he did switch to dries) and presumably Renault's ‘longer’ strategy - with it carrying greater fuel load weight with its implications on lap time - had greater flexibility of the timing of that switch to dries in mind. This would have played at last some part in Button’s superior pace to Alonso later, as well as Alonso being able to stop one time fewer. This I feel should be acknowledged. Remember also that the timing of Alonso's first stop was forced by the safety car appearance. And as I outlined his lead was increasing by the order of three seconds a lap at the time. I don't know how much longer Alonso was due to go in that stint (if you have this information I'd be interested to hear it) but even if it was another three laps that would have stretched his lead over Button to close to a minute. I would also like to dispute your estimate of a 30 second pit stop loss time. Button after emerging from his second stop that day, before which he was right behind Alonso, was 20 secs behind the Renault. Again granted this stop was rather a splash-and-dash, but Michael Schumacher pitted on the same lap and fuelled to the end and was stationary only for 2.4 secs longer than Button. That suggests an ordinary pit stop loss time in this race was more in the region of 22-23 seconds rather than 30 seconds. Indeed my general recollection of that era was even that with the additional 'nozzle time' for refuelling that 30 secs pit stop loss times almost never happened. So even if we park the debate about how many stops Button was planning, my two points combined suggest that rather than a likely 19 sec lead for Alonso without the safety car his lead more probably after his first stop would have been something like 37-39 seconds. Surely a decisive race-winning advantage. I accept however that the Honda's issue with tyre warm up was a mitigating circumstance that I should have acknowledged. As for my comments on your race report, yes if I had my time again writing the article I'd have included the text you outline from your report complimenting Alonso for the sake of fairness. However I do stand by my central contention that the report could have given much greater focus to Alonso’s drive, that some of the claims such as implying Button didn’t ‘let the leaders escape’ were dubious as well as that the report did not give due note (or really any note) to the extent that the safety car deployment impeded the Spaniard. Without it and the mammoth amount of time it got Button over Alonso surely subsequently debates about Button's pace in this race would have been moot, certainly as far as the win is concerned.